It used to be easy to find foods high in magnesium, but due to industrialized agriculture and soils that are depleted of nutrients, it is now difficult. Few people obtain the magnesium RDA which is set at 320 for women and 420 for men. This is just enough to ward off deficiency. While magnesium-rich foods include many whole grains and vegetables, much of it is lost in food processing and cooking. Refining flour removes 96% of the magnesium, as most of the magnesium is found in the husk and germ. 93% is removed from refining rice. Those that eat a diet containing processed or packaged foods usually get about 150 mg of magnesium per day. A whole foods diet is essential to increasing magnesium intake. Good sources of magnesium are vegetables that are high in chlorophyll, such as dark green leafy vegetables. 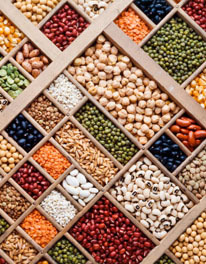 Other good magnesium sources are seeds, nuts, beans and whole grains. Foods high in magnesium with their content of magnesium in milligrams. What increase the body's need for magnesium? 1. Balch, A. Phyllis. CNC Prescription for Nutritional Healing, Fourth Edition (New York: Penguin Group, 2006) 36. 2. Seelig, M. Magnesium Deficiency in the Pathogenesis of Disease, (New York: Plenum Press, 1980).